The professional services market is back—and more competitive than ever. How will you outperform your competitors? By monitoring the financial metrics that matter. 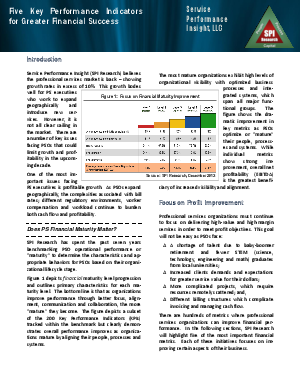 Through years of thorough research, Service Performance Insight has analyzed and identified the profit-centric measures that are highly correlated with financial success in professional services. The importance and primary characteristics of financial maturity. The 5 financial metrics critical to service organizations. Where successful service organizations fall in these metrics.